Smart entrepreneurs who want to use the web to attract leads and make sales must master the fields of psychology and human behavior. And Social Triggers Insider helps them do just that. On the show, Derek Halpern from Social Triggers features world-class researchers, professors from top universities, New York TImes Best-selling authors, and then he breaks down their insights into easy-to-implement action plans for entrepreneurs who leverage the web to grow their business. You can expect to learn cutting edge marketing tactics, deep psychological insights, how to persuade people to buy your products and services, social media marketing tips, email marketing strategies, and various other online marketing strategies that are VITAL for thriving in today's overcrowded marketplace. Today I’m pumped to share the unusual story behind how Marc Ecko turned his love of street art into a billion dollar clothing company. You see, like most artists, he got the “itch” early on, but he abandoned his craft for a much more stable career move – pharmacy school. He didn’t last long though, and he soon dropped out to launch a clothing company. 1. This isn’t some “rosy” tale of crazy success. Yes, he built one of the largest clothing companies, but he flirted with failure and beat it. It’s inspiring. 2. He’s a commercial artist. He never “sold out,” but he did turn his art into a successful business. All business owners should take note. 3. If you’ve ever stressed about designs or logos, you’ll see what Marc Ecko – the street artist – thinks about logos. It might surprise you. 4. Have you ever thought, “It’s gotta be hard to build a business based on creativity?” If yes, you’ll see how Marc Ecko makes it sound like anyone can do it. When you’re done, leave a comment sharing your BIGGEST insight – and how it’s going to help you. Or, have you ever walked away from pursuing one of your dreams because you went after what you thought was “more stable?” What happened? Share your story as inspiration! As I mentioned on the podcast, Marc Ecko has a new book out. It’s called Unlabel: Selling You Without Selling Out. I received an advanced copy and read it in like 2 days. It was a book I just couldn’t put down. If you’re a creative, and you’re looking to make a living from your work, I believe this book will be the book you reference for years to come. So, I highly suggest you pick up the book here on Amazon. That’s an affiliate link, but trust me – it’s not for the commissions. 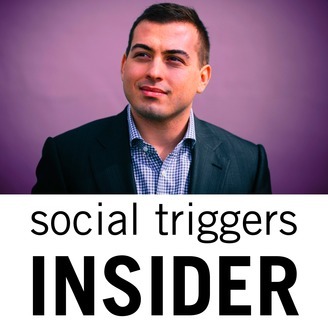 I use book sale numbers to ensure I continue to land the BEST guests on Social Triggers Insider. Period. I should also note: By now, as a Social Triggers subscriber, you probably know I’m an avid reader, successfully reading a few books each week. And I can honestly say this is one of the better books I’ve read in the last 12 months. 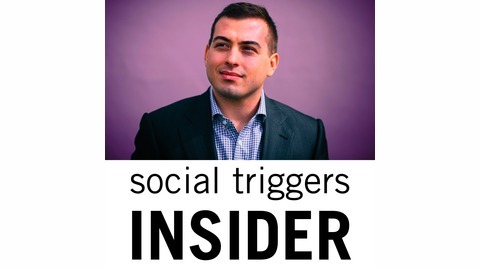 Did you know Social Triggers Insider is now on iTunes? If you enjoy this series, please take a few seconds and leave an honest review. There are 317 of them and we need to hit 350! The transcript for this podcast is not available… yet. Please check back. HA! You won’t BELIEVE what this guy did at dinner. And that’s why he’s successful.